Farmers and landholders in Central Western Queensland are calling on Federal Energy Minister Josh Frydenberg and state ministers to give them the right to say ‘no’ to mining at the next meeting of the COAG Energy Council on Friday 4th December. Denice Campbell from the Galilee Basin Alliance said it was vital this meeting delivers tangible action and gives farmers, landholders and Traditional Owners the power to refuse mining companies access. “While mining companies ultimately have the right to access someone else’s land and do to it what they will, usually without any consideration for the agricultural industry that is already in place, there will never be justice for ordinary people going about their businesses in this country. This applies equally to Traditional Owners. It is wrong, ordinary people know it is wrong, politicians know it is wrong; they have said so in public forums. Yet nothing continues to be done because the mining companies have powerful allies in all political arenas. This corrupted process needs to end now or there will be huge costs to be faced in the future not unlike the stories and consequences of the “stolen generation”. “The bullying and harassment of landholders and Traditional Owners by mining corporations needs to end now. Governments need to prevent any further harm to rural and regional families“ Ms Campbell said. 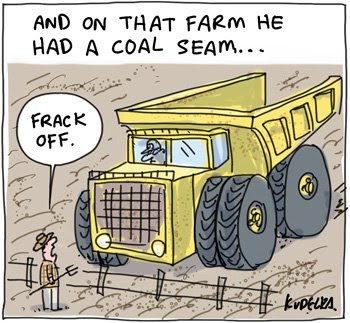 The private senator’s bill proposed to make gas or coal mining activities undertaken without prior written authorisation from landholders unlawful and would ban constitutional corporations from engaging in hydraulic fracturing operations (fracking) for coal seam gas, shale gas and tight gas. the committee received by email approximately 350 short statements and form letters in support of the bill or that discussed matters beyond the scope of this inquiry. The committee decided not to publish on its website every email and form letter it received. An example of each type of form letter has been published. A new scorecard for Queensland reveals proposed new planning laws would be worse for the Queensland community and the environment than the planning laws in place under the Bligh government in 2012. The scorecard, prepared by Environmental Defenders Office Qld (EDO Qld) and Queensland Conservation Council (QCC), comes after Deputy Premier and Minister for Planning Jackie Trad tabled the Government’s Planning Bill 2015and two related bills in Queensland Parliament late Thursday. The LNP Opposition also has draft planning laws that will be up for consideration by parliament at the same time as the Government’s planning bills. EDO Qld solicitor Revel Pointon said the scorecard was designed to help the community make sense of complex planning laws and revealed Queenslanders were not getting the first-class planning framework they deserved. “We compared both the Government and the Opposition bills to see how they compared to planning laws in place under the Bligh and Newman governments. “The QCC/EDO Qld scorecard assessed all the planning laws against four key indicators: protection of nature; support for community participation in planning; promotion of accountability and transparency; and whether they provide certainty to the community. “The scorecard findings reveal the Opposition planning bills would be the worst outcome for Queensland, but disappointingly the current Government’s proposed laws are not much better. “There are serious accountability and transparency shortfalls in both the Government’s and the Opposition’s proposed new planning and development assessment laws, mainly due to too much flexibility surrounding decision-making that tends to favour developers interests over the community. “The current Government is clearly better on community involvement in planning and development assessment, in particular proposing to restore rules in the Planning and Environment Court that will protect the community from the threat of massive costs. “However, the Government’s bills are only marginally ahead of the Opposition Bills on the other three measures. “We are particularly concerned the government has decided to continue with its single assessment system – SARA – which weakens the role of specialist departments such Department of Environment and Heritage Protection. “If the Deputy Premier wants planning based on the best science, we need our specialist departments to have a strong decision making role in planning and assessment decisions. “We need strong, clear planning legislation to protect the environment for the future and to protect the community’s right to have their say on development that affects the places that matter to them,” said QCC planning spokesperson Karen Robinson. “However both sets of planning laws will further entrench the presumption of development approval by weakening controls on code assessable applications. “They also reduce the community’s rights to oppose development that does not comply with local plans and planning schemes,” Ms Robinson said. “We are already seeing rising discontent in the community, particularly in south-east Queensland, as people wake up to find 15 and 20 storey apartment buildings approved where plans allowed just 6 and 12 storey. “At the same time, scarce parkland and important koala habitat is being removed from protected zones and made available for development. The Planning and Development (Planning for Prosperity) Bill 2015 (and two associated bills) were tabled in June as Private Members Bills by Shadow Treasurer Tim Nichols.